Published: Dec. 5, 2007 at 11:00 a.m.
Randy Moss is being double- and tripled-team every week, so his numbers have been down a bit. Should I consider reserving him for a hot wide receiver like Hines Ward or Roddy White? --J. Flynn, Coconut Creek, Fla.
Michael Fabiano: It's true that Ward and White have been on absolute fire in recent weeks, while Moss has been held to a combined 77 yards and one touchdown in his past two starts. But now that we've reached the fantasy football postseason, it's impossible to reserve the most dangerous and productive wideout in the NFL. As much as I love White this week against New Orleans on Monday Night Football, I could still never sit Moss. 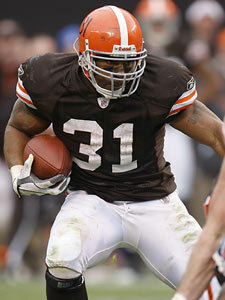 Jamal Lewis has developed into one of the hottest runners in fantasy football. M.F. : Unless you receive points for receptions, I'd have to sit the inconsistent Berrian and use Gore, Lewis and Portis. Nine times out of 10 I will use a back over a wideout as a flex starter in a standard league, based on the fact that backs are guaranteed to see the football. Lewis did hurt his ribs in a loss to Arizona, but it appears he'll be fine to start against a weak New York Jets run defense in Week 14. M.F. : It's hard to sit a back of Addai's caliber in the fantasy football postseason even against a formidable Baltimore run defense, so the decision boils down to Grant and Portis. I do like the Redskins runner on Thursday night (8pm EST, NFL Network) against Chicago's vulnerable run defense, but I'd have to agree with you and side with Grant. He has been one of the hotter backs in the NFL in recent weeks, and he faces an Oakland defense that ranks 30th against the run and has surrendered an NFL-high 20 rushing touchdowns. M.F. : I'd take any one of Furrey, Johnson and McDonald (I'm not a fan of Williams), as all three will see far more prominent roles in their respective offenses. Furrey will start in the absence of Williams, and it appears Johnson will start with Boldin's status in certain doubt. It's hard not to like McDonald as well, as he's second behind Williams in receptions, receiving yards and receiving touchdowns in Detroit. In order, I'd put in claims for Furrey, Johnson and McDonald. Which two wide receivers should I start from Deion Branch, Greg Jennings, Wes Welker and Roddy White? -- J. Laub, Huntington Beach, Calif. M.F. : All four of these wideouts are viable starters, but I'd side with Jennings and White in a standard format. Believe it or not, White has more fantasy points than Terrell Owens, Reggie Wayne and Torry Holt on NFL.com in the past two weeks, and he faces a New Orleans defense in Week 14 that ranks 28th against the pass and has allowed 21 receiving scores. Jennings has a tough matchup against Oakland, but he has scored at least one touchdown in all but two contests this season. Of course, if Brett Favre is less than 100 percent (he is expected to start at this time), it might be better to reserve Jennings and use Welker instead. M.F. : This is a difficult call based on the fact that all four runners are solid options in fantasy football formats. However, I'd have to side with Graham and Grant in Week 14. As I mentioned in an earlier question, Grant has been a statistical monster in recent weeks and faces an Oakland defense that ranks 30th against the run and has surrendered an NFL-high 20 rushing touchdowns. Graham has been as hot (if not hotter) than Grant, and he battles a Houston defense that ranks 25th against the run. It is hard to sit backs the caliber of Barber and McGahee, but both have less attractive matchups than Graham and Grant based on the numbers. One of the most respected fantasy football minds in the business, Michael Fabiano is here at NFL.com. In addition to providing first-class fantasy analysis, Fabiano will answer your fantasy questions in his weekly mailbag. Got a question for Mike? Click here to submit it. M.F. : Bulger passed an examination this week and is expected to return to practice, and he's the most attractive option based on a matchup against a vulnerable Cincinnati defense. With Garcia at less than 100 percent and Campbell playing on Thursday night, however, you might want to add another quarterback that starts this weekend as insurance for Bulger. Brock Berlin would start for the Rams if Bulger suffers a setback, as Gus Frerotte is out with an injured shoulder. I need to pick two backs and two flex starters from Reuben Droughns, Warrick Dunn, Andre Hall, Jerious Norwood, Willie Parker and Fred Taylor. Advice? -- M. Lasjer, Bangor, Pa. M.F. : I'd have to start both Parker and Taylor, which leaves you to pick from Droughns, Dunn, Norwood and Hall as flex options. Travis Henry has won his appeal with the NFL and will not be suspended, so Hall has little value at this point in time. Brandon Jacobs is expected to return in Week 14, but Droughns could still see some goal-line work and is worth the risk if the league is touchdown based. If it's a standard format, however, I'd side with Dunn and Norwood. I would also see if Samkon Gado or Fred Jackson is available on waivers and start one of them ahead of Dunn, as each could see a prominent role due to injured starters ahead of them on the depth chart. I am desperate for a quarterback this week. Can you offer me some options that might be on the waiver wire? Help! -- S. Phillips, Dearborn, Mich. M.F. : First I'd look to see if Jacksonville's David Garrard is a free agent. Somehow he is still a free agent in 30 percent of NFL.com leagues, and I love him this week against Carolina. Other lesser (but stil viable) options include Kellen Clemens (vs. Cleveland), Chris Redman (vs. New Orleans), Tarvaris Jackson (at San Francisco) and Trent Dilfer (vs. Minnesota). I've made a late run to make the postseason in our league. Now I need to start two running backs from Ron Dayne, Justin Fargas, Edgerrin James and Fred Taylor. Who should I start? -- D. Bailey, Eagan, Minn. M.F. : Fargas has a terrible matchup in Green Bay, but it's still hard to sit a runner that has been as hot as Fargas over the past two weeks. I'd also start James, who faces a Seattle defense that has allowed 14 rushing touchdowns and has been inconsistent against the run.